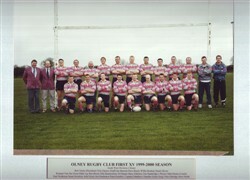 Olney RFC 1st XV 1999-2000 season, colour team photograph: 19 named players in kit posing under rugby posts. Back row: Ian Bennett, Dave Basely, Willie Boulton, Stuart Glover, Richard Van Der Grout, Mark Lay, Ben Brock, Ollie Brackenbury, Ed Harper, Barry Elderton. Front row: Paul Wetherup, Stuart Howkins, Adie Doyle, Jim Pemberton, Peter Kemble (captain), Matthew Chandler, Dylan King, Chris Eldridge, Dave Smith). Four named others: Bob Taylor (President), Nick Dayton (Staff), Tim Stanbridge (physio), Matt Deans (coach).